Fresh from its recent and successful launch of their iPad, Apple is continuing the momentum as they've pinned a date for the "sneak peek" unveiling of iPhone OS 4.0. With April 8 just only 3 days away, things are starting to point back to Apple's legendary smartphone as it will undoubtedly be graced with OS 4.0 in the near future. The company has sent out invitations for people to witness and experience what the next incarnation of the platform has in store for owners. There are already some speculations as to what it'll offer – like the highly requested multi-tasking feature that has yet to pull its head out of the shadows. In any case, there is no doubt that Apple is once again mustering up its shoes soon after the launch of the iPad – could we also see a special guest at the event in the form of the next generation iPhone? 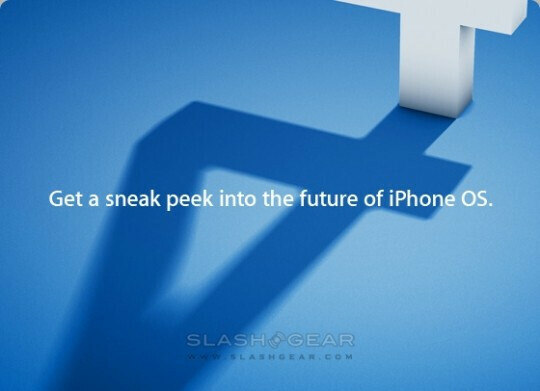 All eyes will surely be pointed towards the event as things are becoming more interesting out of Apple's camp. I'm soooo excited!! This will decide whether I continue with iPhone or move on to another OS. Very uncharacteristic of them to do this. Cant help but think this is in response to the EVO 4G announcement... trying to keep Iphone people from jumping ship. Maybe, but I don't really even think the EVO is that much of a threat (it's still a really good phone though). The only thing really different about the phone is the fact that it's the country's first 4G device. But by the end of the year, there should be a few more that will be able to have 4G speeds. I thought it was very odd of them to do this also, but they did have a preview on March 17th of last year. I personally think that 4.0 is for the ipad mainly. Apple probably wants to continue the momentum they have with the product and announce some features that both the ipad and the iPhone will be able to do. I'm hoping for some knd of multitasking as well. I'm having doubts too, but if no multitasking then what would be the point of 4.0? It would be like 3.2 or something. I don't really see what else they would add. Maybe they'll give us the drop down menu they promised about one and a half years ago. I'm just hoping it's big. 2.0 brought the app store. 3.0 brought universal search, copy and paste, in-app purchasing, peer-to-peer connectivity, landscape mode fore more stuff, MMS, more YouTube functions, etc. Some of these functions were long overdue but that's still a lot of stuff in the update. If 4.0 doesn't deliver, I'm going to be pissed. Well technically, phones haven't been able to change the background picture of the UI for the last 10 years. But being able to do that on the iPhone would be nice. it's pretty impressive that they made it all the way to the announcement of the announcement without anything being leaked yet. I need to see more then just multitasking. They got a lot of catching up to do before Android blow them out the water. What's up with a little personalization! Okay Legacystar, you're being such a downer right now. You obviously have an Android device and you obviously don't like Apple so I don't see the point of even being here. And the pull down menu Apple promised was just for changing 3G/2G, Wifi, and Bluetooth but if they add more functionality, I probably won't complain. And let's not get started on clones now. Are you enjoying multitouch and your Android Market on your Droid?